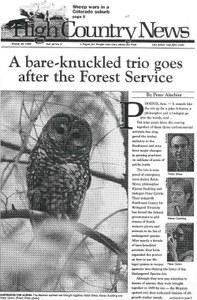 The founders of the Southwest Center for Biological Diversity - Robin Silver, Kieran Suckling and Peter Galvin - are uncompromising and obsessive in their goal of preserving endangered species. In his own words, physician and photographer Robin Silver describes the strategy and ideals of the Southwest Center for Biological Diversity. In his own words, philosopher and activist Kieran Suckling describes the vision behind his involvement with the Southwest Center for Biological Diversity. In his own words, activist Peter Galvin explains how he came to be involved in the creation of the Southwest Center for Biological Diversity. Fish biologists Jim Cooper and Jerry Stefferud and retiree Leon Fager are among the staffers of the Southwest Region of the Forest Service who say the agency has betrayed its trust by favoring timber and grazing over wildlife and forests. Photographer Sara Wiles exhibits 20 years of powerful photographs of Wyoming's Arapaho people. Photographer Bruce Hucko's exhibit "Images from an Untamed Land" celebrates the Four Corners region. The third annual Wallace Stegner Center Symposium features Aldo Leopold's Legacy, April 17 in Salt Lake City, Utah. The 101st National Western Mining Conference and Exhibition will be held April 15-18 in Colorado Springs, Colo.
Gov. Jim Geringer of Wyoming will speak to biologists and ranchers on "Are Feedgrounds Forever?" at the Wyoming Wildlife Federation annual meeting May 15-17 in Dubois, Wyo. Public land agencies in Wyoming, South Dakota and Nebraska have issued a guide to high school groups and college students for hands-on experience. The 20th annual High Desert Conference is slated for April 30-May 3 at the Malheur Field Station near Burns, Ore. Postal stuff; Lynda Taylor leaves HCN board; Dustin Solberg returns; visitors; Great Basin magazine ends. The National Park Service is being sued by three environmental organizations for allowing private "bioprospecting" in Yellowstone National Park and backing off from its mandate to protect the park's resources. Idaho Gov. Phil Batt defends state; Stone Container Corp. settlement; Oregon's Wes Cooley back again; Rep. Chris Cannon loves Lake Powell; USFS buys Valles Caldera in New Mexico. 'Ecotourism' - a gold mine for ailing agencies? "Heritage Expeditions" for ambitious ecotourists with extra cash, are a new part of the user fee demonstration program that some think will raise money while educating people about natural and cultural sites. The nonprofit Global Exchange offers "reality tours" that put tourists face-to-face with poverty and other problems, including environmental issues. A "sheep war" in a Colorado subdivision where neighbors are battling over the eight sheep one family owns, shows two dreams of the West in collision, with a lot of legal fireworks. Locals and critics charge that Vail Associates is using a ski area expansion as an excuse to develop the area and sell valuable real estate at the expense of elk and lynx habitat. Some locals are upset over the EPA's desire to expand its mining cleanup in Idaho's Coeur d'Alene Basin. An audit shows that money intended for Colorado state wildlife programs has been spent to buy land for prisons in Rifle and Delta. A grand jury's "secret" report on Colorado's Rocky Flats bomb factory reveals a reckless decade at the nuclear weapons plant before it was closed in 1989. The controversial Mohave power plant in Laughlin, Nev., is a huge operation that provides pollution as well as power to the Southwest. A former Hopi chairman says that the owners of the Mohave Generating Station in Laughlin, Nev., whose smoke pollutes the air of the Hopi Reservation, have the ability and the obligation to clean up the plant without closing down.